The following is a suggested study guideline for the freshman student starting out in surveying mathematics that utilizes the Books and Web Apps that are available on this website. 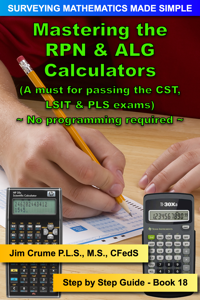 Start with Book 18 - Mastering the RPN & ALG Calculators. This will give you the skills needed to master the calculator that will be a great benefit as you progress through each of the books in this math-series. I have used both types of calculators and the RPN is by the best in my opinion. Both types are covered in this book. Mastering the calculator is the KEY to a timed survey exam. Being able to calculate bearings, angles, convert from Degrees-Minutes-Seconds to Decimal Degrees and back again is vital in performing mathematical calculations. This is where most people mess up when taking exams. They forget to convert from D-M-S to D.ddd and back at the appropriate time. You have to stay focused when performing this conversion on the calculator. 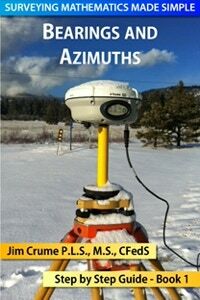 Next: Book 1 - Bearings and Azimuths. This instructs you on understanding what a course direction is. 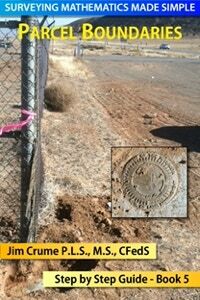 All legals descriptions, plats, results of surveys, ALTA’s contain bearings or azimuths. The course direction is the foundation to all rectangular coordinate calculations. You need to know how to add and subtract angles, bearings and to convert from D-M-S to D.ddd and back again. to confirm you are getting the correct answer. 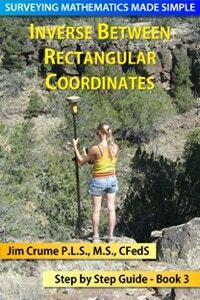 Next: Book 2 - Create Rectangular Coordinates. This instructs you on how to utilize a course bearing and a distance to create rectangular coordinates. Formulas are provided to create a latitude and departure for each course then add those to the beginning coordinate to establish the ending coordinate for the course. 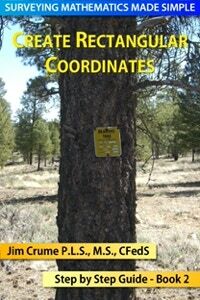 Rectangular coordinates are needed for data entry into a survey data collector for every survey. Next: Book 3 - Inverse Between Rectangular Coordinates. This instructs you on how to inverse between rectangular coordinates. It is the opposite of creating rectangular coordinates. There are many situations that require a bearing and a distance between two known points such as performing a radial stakeout from a control point. RTK GPS and Robotic Total Stations does this on the fly when staking out boundary corners and for construction layout. Next: Book 4 - Circular Curves. This instructs you on how to calculate a circular curve, reverse curve & compound curve. Formulas are provided that will let calculate any component of a curve given only two elements such as Radius and Delta Angle. There are solutions available for any number of curve components. Circular curves are used everywhere such as legal descriptions and centerline alignments. Next: Book 5 - Parcel Boundaries. This book brings books 1 to 4 all together to instruct you on how to calculate a parcel boundary, check it’s closure and calculate the area of a parcel. Steps are provided to insert the information into a spreadsheet for easy calculations for error of closure and cross coordinate method for parcel area. The area for a curved segment is explained. The following books are available as reference material. 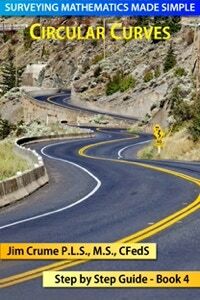 The following book is for Licensed Surveyors that want to migrate into the digital signature world.